The Abbotsford area was once bush along the Yarra River sporadically occupied by the Wurundjeri people. The area of Abbotsford was first subdivided in 1838 and sold at an auction in Sydney. One of these lots was purchased by John Dight and the lot was later called Dight's Paddock. Dight then further subdivided the land into 5 acre (12 hectare) lots and in 1878 Edwin Trenerry, a Cornwall-based property developer, purchased a large portion of Dight's Paddock for his nephew Fredrick Trenerry Brown and proceeded to further subdivide it for a residential estate. In order to provide recreational facilities for potential residents and hence boost the value of the lots being offered for sale Fred Brown and solicitor David Abbott created a sports oval and called it Victoria Park in 1879. Abbotsford quickly established as an industrial area, home to many Irish, mostly factory workers, and until the construction of Melbourne's sewerage and drainage systems was regularly flooded by the Yarra River. Like many inner Melbourne suburbs, its working class origins have given it a reputation for crime. Since World War II the area has become quite ethnically diverse, with many Greeks, Italians, Vietnamese, Chinese and more recently Arabs and Africans, making it their home. In the 1960s a section of the northern part of the suburb was demolished to make way for the Eastern Freeway. 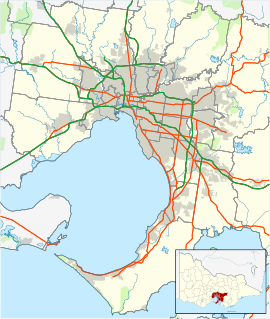 Along with Clifton Hill and Collingwood, the suburb was a part of the City of Collingwood, until former State premier Jeff Kennett conducted a wholesale merger of local government areas in 1994. Property values have skyrocketed in recent years and many young professionals have moved to the area and the old industrial areas have experienced significant gentrification and urban renewal since 2000. A steady stream of migration since the 1980s has made Abbotsford home to Melbourne's largest Vietnamese community. So much so that Victoria Street is also known as Little Saigon. It is best known for its exceptional varieties of Vietnamese food, which draws tourists to the area from across Melbourne. Abbotsford is home to Carlton and United Breweries, the company which produces Victoria Bitter and Foster's Lager. The malt smell of brewing often fills the surrounding area. Visitors can see the beer making process at the Carlton Brewhouse centre and tour the brewery. Smaller breweries such as Moon Dog Craft Brewery and Bodriggy Brewing Co are also located in Abbotsford. Dights Falls, where the Merri Creek and Yarra River joins, is a short walk from the Collingwood Children's Farm and is a favourite spot for kayakers and picnickers. Cyclists pass through the farm on the Yarra River Trail, which follows the Yarra River from the city to Dight's Falls, where it meets the Merri Creek Trail. This also forms part of the Capital City Trail. Studley Park, an extensive parkland which merges with the larger Yarra Bend Park, contains Dights Falls and features within it a golf course, sports grounds, and small pockets of natural forest. Victoria Park was the home ground of the Collingwood Football Club from its inception in 1892 until 2005. AFL matches are no longer played there, but Collingwood's reserves team are scheduled to play in nine matches per season in the VFL competition from 2010 onwards. Collingwood Children's Farm was established in 1979 by the local community with the support of the former City of Collingwood and the former Department of Education to give city children "a taste of country life". It is located next to the grounds of the Abbotsford Convent Arts Precinct and a Steiner School, on a bend in the Yarra River. It is a small-holding, fully functioning working farm with Rare Breeds livestock, vegetable gardens and fruit orchards. Community Garden Plots are also a part of the Farm. Eggs and seasonal produce are for sale, and visitors are encouraged to interact with farm animals through activities such as cow milking (daily at 10am and 4pm). The Collingwood Children's Farm is sited on the Abbotsford Precinct Heritage Farmlands, the oldest continually farmland in the state of Victoria; farming commenced in 1838 (although anecdotal evidence suggests farming commenced as early as 1836) and has continued uninterrupted since that time. The former convent itself was also home to the Lincoln Early Childhood Studies Institute and a campus of La Trobe University for a while, but is now the site of a community and arts precinct use after protracted negotiations between developers, the state government and the Yarra City Council. The Skipping Girl Sign, the first animated sequence neon sign in Australia, is located at 627 Victoria Street. Abbotsford contains some impressive public buildings, most of them centred on the historic Collingwood Town Hall precinct. Among them is the Carringbush Library, a former Church of Christ, built between 1888 and 1889 in the classical style to the design of Jonathan Rankine. It is on the National Trust register. The Sailors and Soldiers Memorial Hall is an unusual looking free classical building constructed in 1927, on Hoddle Street. Like many of Melbourne's inner suburbs, there are few detached houses in Abbotsford. Residential streets are often narrow, and some streets are leafy. A large proportion of houses in Abbotsford are subject to Heritage overlay provisions, which protect their heritage value. The older residential sections consist mostly of working class single-storey Victorian terrace houses. Some double-storey terraces are found along the railway line and off the tram line on Victoria Street. Unlike the terraces in the wealthier suburbs of the City, many in Abbotsford remain in a state of disrepair and few have been renovated. Among the notable ones are terraces in Charles Street, and the identical pair of Dorothy and Winniefrir terraces in Lulie Street, which are listed on the Victorian Heritage Register. In recent years, many previous industrial and commercial sites have been redeveloped as housing, including sites along the Yarra River and the Denton Mills hat factory. Abbotsford is a prominent early industrial area and as a result, there are several outstanding examples of industrial buildings. The most prominent is Denton Hat Mills, a large turn of the century industrial complex designed by architect William Pitt in polychrome brick in 1888. It was the home to Brush Fabrics until 2004, when plans for conversion to apartments were implemented. Work on the conversion began in mid-2007 and was completed in December 2009. Prominent hotels include the Carringbush Hotel. It was built in 1889 and was originally named the Friendly Societies Hotel. There are five bridges on the eastern boundary. A footbridge across the Merri Creek at Dights Falls. The Johnston Street, Studley Park Road bridge. First bridge (wood) was built in 1858 and was replaced (iron) in 1876. The 1892 Walmer Street footbridge, connecting Walmer Street Kew and Burnley Street Richmond. The 1884 Victoria Bridge, connecting Victoria Street to Barkers Road Hawthorn (later widened). This bridge replaced a ferry. Between 1857 and 1899 a privately owned tollbridge, or 'Penny Bridge', connected the north end of Church Street to Yarra Bend Park. Abbotsford has a government primary school (Abbotsford Primary School) and the Sophia Mundi Steiner School, which caters for students from Prep to Year 12. Two railway stations are located in Abbotsford, both on the Mernda and Hurstbridge lines. The Collingwood railway station services the middle of the suburb, whilst Victoria Park station services the northern section and Victoria Park stadium. Nearby North Richmond Station also services the southernmost part of the suburb. Tram route 109 (Port Melbourne/Box Hill) runs down Victoria Street and route 78 terminates at the corner of Church Street and Victoria Street (technically in Richmond). Hoddle Street is one of the most congested roadways in metropolitan Melbourne. The Eastern Freeway feeds into it at the northern end. Much of Abbotsford is serviced by narrow one-way streets and is punctuated by the main streets of Hoddle, Nicholson and Johnston Streets. Hoddle Street is a major busway and includes a dedicated priority bus lane along the length of the Abbotsford section. ^ Australian Bureau of Statistics (27 June 2017). "Abbotsford (Vic) (State Suburb)". 2016 Census QuickStats. Retrieved 12 February 2018. ^ Kennedy, B: Australian Place Names, page 1. ABC Books, 2006. Wikimedia Commons has media related to Abbotsford, Victoria. This page was last edited on 30 March 2019, at 11:47 (UTC).